PAX Unplugged, being my first true tabletop convention, was an eye opening experience in more ways than I’d expected. I got to see so many new and exciting games, but I also ran across many, like Archmage by Starling Games, that had already been delivered to Kickstarter backers like myself and were now available to the boardgaming masses. It’s always a lovely feeling, walking by a table and seeing a game you know being played, like a shared sense of empathy and joy for the fun those gamers are about to discover in their new cardboard adventure. Archmage was an odd one for me to pass on the show floor, however, as I’d come off my initial experiences with it lukewarm. It just seemed to lack a certain—something—and it didn’t excite me the way I though a game about growing a following of mages and inventing new spells while battling for territory on an overworld map would. And yet, since I’d received and played my copy, and somewhat fallen out with it, I couldn’t stop thinking about it, or rather how I couldn’t seem to come to terms with culling it from my game library. Shot of the board featured from Tabletopia. So many exciting colors! Game collection cullings happen all the time across our hobby. Every so often, more often for some than others, though experienced at some point by all, we move beyond games we’ve previously purchased. We buy out of hype. We buy for the pretty artwork. We buy because of the promised experience we think is in the box. We buy because of FOMO (that is, the “fear of missing out”). Maybe we just haven’t played a game for years and it’s time to find it a better home with a new owner. For whatever the reason, we cease to care about games in our collections, and we decide to sell or donate them to make room for newer things. My own library of games is reaching that point. 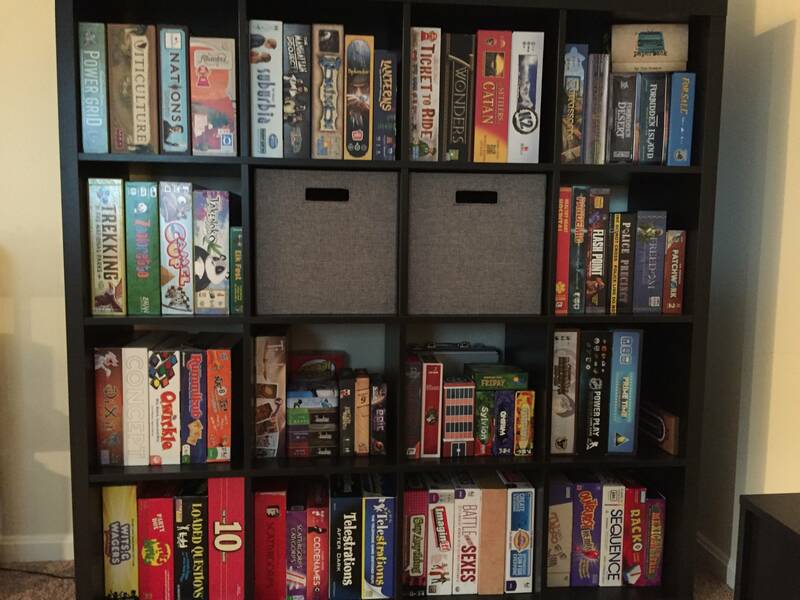 I have limited shelf space in my home, the beloved Kallax not being an option for our floor plan, and so it’s that time for me to seriously consider what games are leaving my home for good. I’ve already got several on the list: games I never really connected with like Ethnos (don’t judge me) and games I haven’t played in forever that could use a better home (like Secrets of the Lost Tomb). The detail and graphic design of this game, along with the mage meeples, are quite good. This game is solidly produced! First time publishers can be risky pulls, especially when you involve Kickstarter and all the hype that swirls around it. You never quite know if the design on display will come through as promised, but Archmage genuinely seemed like a gem emerging for the first time to sparkle in the sunlight. Here was a design playtested over years, constantly refined with a critical eye, and polished even more through the publishing process in collaboration with Starling. The components were high quality and the game toted a wonderful premise: recruit little wooden meeple mage followers, use them to control area on a central board, and mix magic on a painter’s palette of a personal board to shoot spells at opponents. A wizard’s dream come true! I was certainly excited for it, and on receiving shipping notification, I eagerly made plans to test it out with friends at game night. And I’ll say this for Archmage: that is exactly what this game delivered. A light and easy to get into experience laid out in wonderfully crafted, high quality components and thematic artwork. It is, in short, everything I hoped that it would be. My hat’s off to Tim Heerema and Starling Games. And yet, somehow this game just never quite clicked with me. Excitedly, we set it up one Thursday night, researching magic and casting spells at each other. But it always felt just a little bit empty, a little bit dry. The theme was there, but something was missing. There was no spark to the magic. I think perhaps it was the magic mixing element, the unique feature of this game and most of its scoring focus; ultimately, all players have access to the same spells, and in virtually all color combinations there is only one spell for each output, leading to a samey feeling that downplays the uniqueness of the spell research. “I’ve learned how to conjure giant fissures in the earth to stop you! What did—oh, you researched the same spell.” It undermines what should feel like rival schools of magic battling against each other in their own, personal ways. This game is accessible, and it has a fair bit of crunch to its strategy, but I think perhaps I was expecting more diversity in the magical research leading to more asymmetrical choices that really highlighted your magical preference. After all, whether you’re throwing down in a game of Magic: The Gathering or a session of D&D, the versatility of magic and how you use it to solve problems is the draw that attracts many a mage. The magic mixing boards are definitely the most alluring of all the components! Archmage, as a whole, fell short for me, and it wasn’t long before it was on my shortlist for a board game cull. Yet, I had mixed feelings, and every time I thought about shipping it to a new owner the pit in my stomach pulled at me just a little harder. There was a tiny voice in the back of my mind whispering to me. “Isn’t it still such a lovely, well-crafted game? Maybe they’ll release an expansion pack of spells!” I hadn’t played the game in months, and given new acquisitions, old favorites, and a campaign-style game running in parallel, it was only logical that this game should go. It would be months, easily, until even the possibility of replaying it surfaced again. Meanwhile, life was moving onwards. A full cleaning of our modest home was underway, and our very limited attic space was being emptied and inventoried. It was culling on a whole-house level! Our basement, filled up as a staging area, was riddled with boxes bound for donation. Others were headed straight for the trash. Amongst them, I recouped several large, plastic storage bins, now emptied, which I intended to cycle some of my games into for reorganized re-attic storage; this would afford me the needed closet and shelf space to continue growing my collection. From their generally less accessible location, I could then easily break things out once I sold them or settled on titles for donation. That last point nagged at me though. Really, all Archmage seemed to need was more spell cards and some basic rules changes to accommodate the added choices. I’m no game designer, but it seemed to me this game was just shy of greatness. Did I really have to let it go? Some of the spells your conclave can research to give you an edge on the main board. To be honest, since writing this article, I’ve finished my cleaning project and for now Archmage is still in a box in my attic awaiting its fate. My experience in trying to let go of it has spurred so many thoughts in me regarding the keeping and letting go of games. Marie Kondo’s name seems to be everywhere these days, in cubicle moves at my office, at home, over Twitter, and I find myself asking: if Archmage doesn’t “bring me joy,” why can’t I just say goodbye to it? Is my limited living space really worth the possibility that this game could be something more in the indeterminate future? The more I think about it, the more it seems this issue shouldn’t be this complicated. I haven’t batted an eye at other titles I’m letting go, so the conflict over this one seems to stick out like a splinter in my mind. I’d be lying if I said it didn’t drive me a little crazy. I have to admit I’ve been terribly selfish in deciding to write this piece for our site (like, even more so than my usual for being an editor at a games site who can write about pretty much any topic he finds interesting). When I began working on this article, I’d hoped that the process of sorting my experiences out in writing would help me reach a final verdict on Archmage. Our minds are strange machines in the way they constantly push unfinished tasks and loose ends to the forefront of our attention. And after the process of taking a couple weeks to work through writing this, all the while tearing my room apart, sorting, storing, carting games off my shelves, rearranging my house, and putting the pieces back together, I am honestly no closer to having an answer. And maybe that’s ok. In fact, maybe that should be the point. In the writing of this article I discovered that a Kickstarter did indeed run for an expansion. I look forward to seeing how it's received. My attic floorboards aren’t going to collapse under the weight of too many cardboard and wooden components, entombing me in a bad decision. My home isn’t stuffed to the gills with games, desperately desiring a pressure release. I have time to meditate on Archmage, a game I want desperately to love, that I’m willing to give second and third chances to for reasons unknown to me. I have time to see if the Kickstarter expansion makes it to retail. I have time to let things hang unresolved. And I think more than anything, the experience has driven home that it’s ok not to have all the answers all the time. There’s nothing wrong with embracing a nebulous sense of uncertainty if ultimately it’s not bringing any negativity into my life. Mystery is ok. The unknown should be embraced. And maybe I should just knuckle down and play Archmage some more, too. I’m looking forward to revisiting this game down the road. In a way, the thoughts I have about that future rediscovery excite me, an adventure that I’m looking forward to when the time is right. I’m glad I’ve decided to keep Archmage for the time being. That’s cool, too!